The Bond Arms USA Defender is a derringer that features blade-front and fixed rear sights, and a custom rosewood grip. The pistol comes with the BAD driving holster. Bond Arms is producing only 5,000 units of this limited edition pistol. 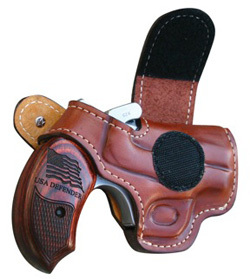 The USA Defender in the BAD holster. 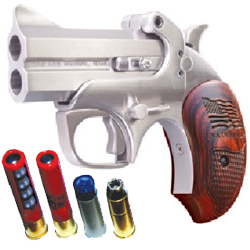 This entry was posted in .22 LR, .22 WMR, .32 H&R Magnum, .357 Magnum, .357 Max, .38 Special, .38 Special +P, .40 SW, .44 Special, .44-40, .45 ACP, .45 GAP, .45 LC, $251-$500, 10mm, 9mm, Bond Arms, Over/Under, Subcompact on October 4, 2011 by Staff.